Who would have thought, in 2016, we would be talking about a bike like Sol Invictus’ Nemesis? Straight from the showroom floor, the Nemesis diverges from most modern retros with its very ‘traditional’ take on classic motorcycling – spoke wheels, drum rear brake, peashooter exhaust, chrome fenders and headlight, black leather seat with vinyl piping, analogue instruments and a kickstart lever. 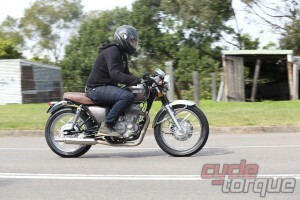 Unlike Yamaha’s revived SR400 – a similarly styled motorcycle, the Nemesis hasn’t gone all the way. One of the Nemesis’ more modern features is an electric start. So it gets a big tick in that department. Sure, if you want to be more ‘authentic’, you can kick ’til your heart’s content. But really, with both kick and electric, why would you bother? Sol Invictus also do their own customisations, so we picked up the Nemesis you see here aced-up in café racer trim. 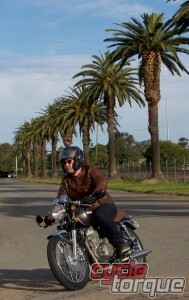 I must say I do like the cut of the café racer’s jib. The rear rack has been removed, with a custom seat added, as well as upside-down ‘bars, ‘bar-end mirrors, Lucas-style tail light, exhaust wrap and a checkered flag tank decal. Sol Invictus’ Nemesis is aimed at someone who likes the look of yore, who may not see the value or possess the mechanical sympathy required when owning a classic. You know, buying old technology new, cheaper than buying old technology which is old. It starts to make sense. “It’s got a fuel tap, I haven’t seen one of those on a road bike in a while,” said Cycle Torque’s Publisher, Nigel Paterson, when he dropped me off at Sol Invictus’ Newcastle shop. Yep, the Nemesis is chock-full of old technology like fuel taps which even have reserve, so when it comes spluttering to a halt you flip the lever the other way and the last few litres can come out, what was known as reserve, back in the day. The powerplant is a mix of old and new – a carburettor-equipped air-cooled single, with twin pipes going either side of the steel frame’s downtube indicating it has four valves, with a pipe for each exhaust valve. Four valves are better than two because it creates a cleaner burn, for more efficiency, economy and emission reasons. For those reasons, it seems strange the Nemesis hasn’t been equipped with EFI. Where many a traditional single had points ignition and a drum front brake, sanity has prevailed there, with a digital ignition and front disc. The frame, suspension, wheel, tank and style is from decades past. Twin shocks, skinny forks, little adjustability… this is not going to handle like a Ninja or MT-03. But it’s not supposed to either, the Nemesis is about style, tradition and class, not high performance and sport. As I set out from Sol Invictus’ digs in Newcastle Mall, I have to say I was pretty impressed with the performance of the engine – the under 400cc market has seen a shift towards liquid-cooled parallel-twin engines, which make their power higher up in the rev range. The Nemesis’ thumper makes its power much earlier on, so getting out in front of traffic requires less aggression with the throttle. Its solo piston has a bigger bore and longer stroke, plus oil-cooling allows the engine to work a bit harder than an air-cooled engine, but not as hard as the liquid-cooling does. Both modern twins and retro singles will do 140km/h, they just get there in different ways. The kickstart works, too, but as I said earlier, with the choice to button-start your bike, without getting into a big discussion about replacing the battery with a capacitor (when you can quite easily hide a lithium-ion battery under the seat), café racer fanatics will know what I mean… The kickstart lever is essentially ornamental. I must have been invisible riding back to the office, with SMIDSY (sorry mate, I didn’t see you) occurring on three separate occasions. It’s a bit ironic – on the café racer you can’t help but feel like you stand out from the crowd which if anything, goes to show most cagers don’t discriminate. But the sun was out, my knees in the breeze, the brakes did their thing and I could see from my mirrors I wasn’t going to get cleaned up from behind. I was happy … to still be in one piece. Tipping into a roundabout and around faster bends, the front-end feels quite light and nimble with its 19-inch front wheel, making the bike really enjoyable to handle around the 60-80km/h speed limit. In low-speed manoeuvres the Nemesis handles just as well. The long stroke thumper engine means it’s really hard to stall. The upside-down handlebars emulate clip-ons which are traditionally used on café racers to give the rider a go-fast, sporty riding position. It usually colours the bike with stiffer handling. The good thing is there is still plenty of leverage on the bars so it doesn’t really interfere with the Nemesis’ sweet handling characteristics. They add a certain custom-style which is one of the reasons for buying a bike like this, but gets tiresome after riding longer than an hour due with the pressure converging in your wrists. In its standard form however, the riding position is great. The more upright ‘bars add linearity, taking away the strain of the café racer’s upside-down ‘bars. The ‘pegs are in prime riding real estate, but fall in the ‘kick your shin’ zone when coming to a halt. It’s a small price to pay for the comfort it provides when the wheels are spinning. The ‘pegs are bulky, just like they were back in the day. A set of smaller aftermarket ‘pegs may peak your interest, if you want to make the bike suit you best. The Nemesis’ brakes do their job acceptably but lack feeling in the lever, although the bike wasn’t fully run-in, they might get better when fully bedded-in. Progressive braking will slow the bike down, up to a point, where harder braking has little to no extra effect. In its intended setting around town and recreational riding most won’t need to push the brakes this far, except for emergency stops, which it receives a pass mark. I might sound like I’m being a bit critical of the bike but it’s nothing history and engineering hasn’t told us already. Overall, I really enjoyed having the bike for a week, enjoying the sound of the thumping single, being able to relax, feel nostalgic and have fun riding the bike for what it is, and the era it represents. So how can I evaluate it? As a package, Sol Invictus’ Nemesis is outdated, but it does what it is supposed to do well, and riders allured by its looks will fall in love with it. Sure, there are modern bikes which can do it better. But by now, if you don’t get the Nemesis isn’t really supposed to, it’s definitely not for you. One does not simply build a bike with 40-year-old technology and magically free it from its original design constraints. If it did, our appreciation for classic bikes would cease to exist, because everybody would still be riding them. The big thing you buy with a Nemesis is not just the classic looks, but the piece of mind of buying new – parts, service, warranty, spares – much cheaper than buying it old. Currently, Sol Invictus is offering the Nemesis XY400 for $6,999 ride-away. If you are checking one out for the first time at either Sol Invictus Sydney or Newcastle, make sure you test one to find out for yourself what all that nostalgia and fun is about. Clasqm I think you are spot on. The bikes are more than likely produced under licence – so the engine is being used in quite a few different bikes around the world under different badges. Correct. It’s a Shineray copy of the Honda engine. SWM is using them as well. These bikes are made by Shineray in China. 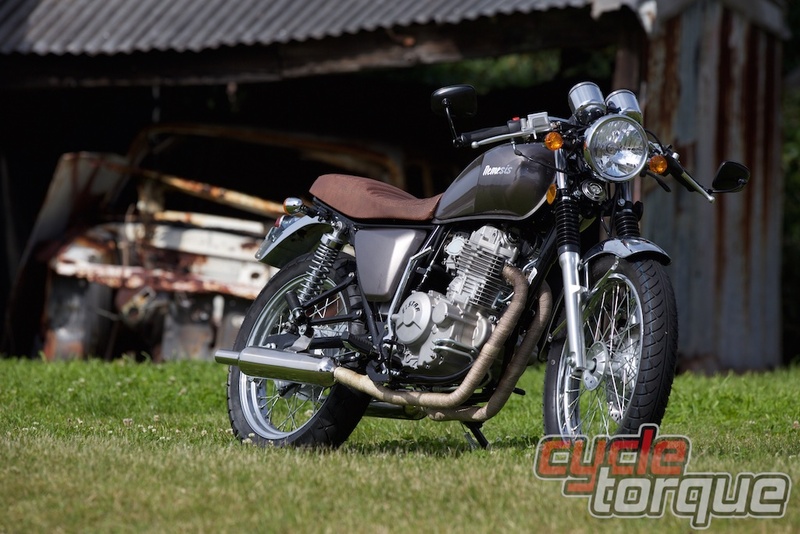 They are a copy of the Honda CB400SS and sold world wide as a Mash or Jawa or SWM or Elstar or what ever name the sellers can think of. They should be sold here a lot cheaper as there are a lot better bikes with more performance for similar money. However if I was looking at buying an old 1972 Honda CB350 again to customise I’d seriously consider one of these or a SWM as a base bike.